Welcome to the medieval fair, a realm filled with princesses and lots of gorgeous fashion! Eliza, Beauty and Aria need your help to prepare for this awesome Ren Fair. 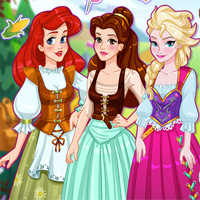 Try on the dresses and outfits and choose the best for each princess. Don't forget to add some accessories that go well with the outfits. With your help, they'll be the loveliest ladies of the Renaissance Fair.